The professors who have great flute playing as well as the best teaching are gathered in one place! The popular star professor Bradley Garner from United States ! -Professor of The Univ of Cincinnati. NYU and The Julliard School. The great professor Guoliang Han from China ! And here is the best flute professors of Korean society ! 1. You can feel the various attraction of the flute performance. 2. You can feel the warm flutists harmony! 3. Wonderful young musicians play concerto with professors ensemble. * W.A. Mozart – Flute Concerto in D Major K.314 1 mov. 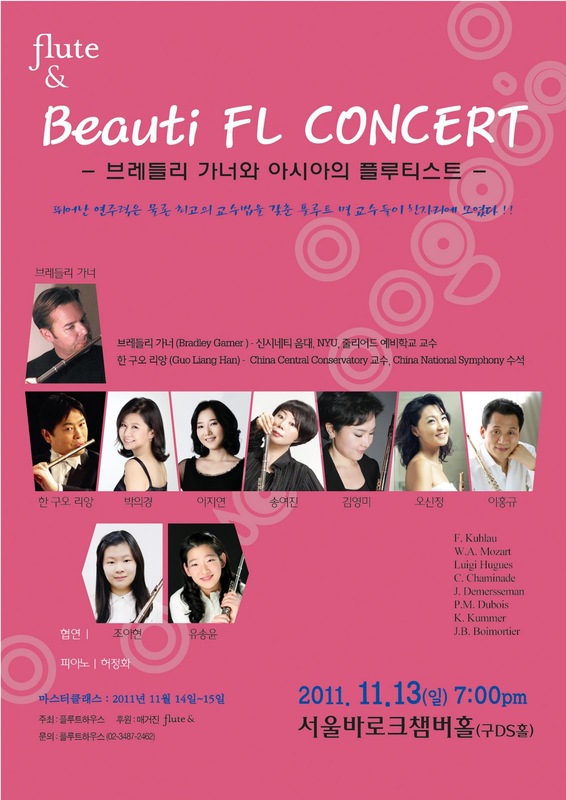 The best flute players of Busan area meet Bradley Garner! Have fun with flute! And here is the best flute players of Busan! 3. 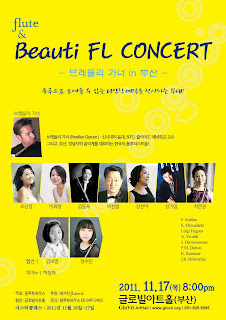 Wonderful young musicians play concerto with Mr.Garner&Busan flutists ensemble. * S.Mercadante – Flute Concerto in E minor 1 mov. * A. Vivaldi – Piccolo Concerto in C Major RV.443 2,3 mov. * W.A. Mozart Concerto in G Major K.313 3mov. * C. Stamitz Concerto in G Major 1 mov. * G.P. Telemann Sonata in f minor 1,2 mov. * J.S. Bach Sonata in C Major 1,2 mov. * J. Ibert Concerto 3mov. * S. Prokofiev Sonata 4mov. * * W.A. Mozart Concerto in G Major K.313 1 mov. * S. Prokofiev Sonata 1,2 mov. * W.A. Mozart Concerto K.313 1mov. * C. Reinecke Concerto 1mov. Bradley Garner is an active soloist, teacher and recording artist in the Cincinnati and New York City areas. He has frequently played with the New York Philharmonic and is the principal flutist with the Atlantic Sinfonietta, the New York Virtuosi and the Virtuosi Quintet. He received his B.M. and M.A. degrees from West Texas State University where he studied with his father, Dr. Gary Garner and Sally Turk. He was the first flutist to receive the Doctor of Musical Arts degree from the Juilliard School where he studied with Julius Baker. Dr. Garner has performed as soloist in Carnegie Hall with Julius Baker and Jean-Pierre Rampal and was the first American flutist to be invited by the Russian government to perform in Moscow's Tchaikovsky Hall. He has performed in Korea, Japan, Russia, Europe, Canada and throughout the United States, and was the featured artist at Flute Festival MidSouth 1998. He is on the faculties of The University of Cincinnati College-Conservatory of Music and The Juilliard School. He has given master classes in New York, Korea, Russia and Japan. Master classes for this year are planned for Japan, Russia, France and throughout the United States. His students have won prizes in many competitions including the Flute Talk Competition, Myrna Brown Competition and the National Flute Associaiton High School, Orchestral, Piccolo, Young Artist and Master Class competitions. 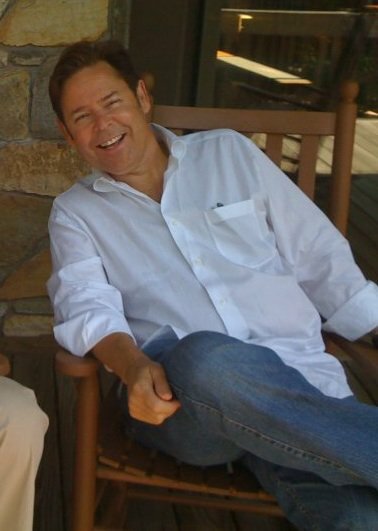 Garner has recorded for the Koch International, Capstone, EMI, Golden Crest, Newport Classics, Vienna Modern Masters and the Collins Classics labels. He is a Yamaha performing artist and clinician.